Recently we were asked to carry out genealogical research for a family whose ancestors emigrated from Kamianets-Podilskyi (alternative names and transcriptions: Кам’янець-Подільський, Каменец-Подольский, Kamyanets-Podilsky, Kamieniec Podolski, Cameniţa, Kamenyeck-Podolszk, קאָמענעץ, קמניץ-פודולסקי) to the States in the end of 19th century. To complete it, to our regret, we had to spend a few days not in this magnificent town but in Khmelnytskyi. 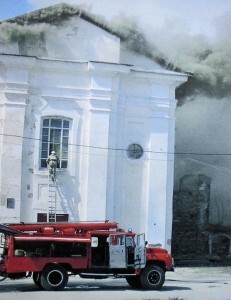 A large part of the Kamyanets Podilskyi State Archive was destroyed in a fire in 2003 and the remnants were transferred to the Khmelnytskyi State Archive. Among the sources useful for Jewish genealogy that were destroyed there were revision lists (censuses for tax and military purposes) and army recruits records. Fortunately, however, an almost complete set of vital records survived the fire and is now available for research in Khmelnytskyi. For your convenience we attach the complete list of books with vital records, arranged according to the year and signature (fond/opys/sprava or fond/opys/tom/sprava, фонд/опис/том/справа). It’s much more precise than the one published on the RTRFoundation website. The LDS Church did not microfilm these records, so the only way to search them is to visit the Khmelnytskyi State Archive. Don’t forget to read our practical review of Khmelnytskyi State Archive before starting your search there. * Contains documents in hebrew. ** Birth certificates for Kamyanets Podilskyi police. *** The books are lost (though still listed in Khemnytskyi State Archive catalog). Perhaps the were burnt in fire or lost during transfer from Kamyanets to Khmelnytskyi in 2003. The 1897 Census (partially preserved).